Bobet Vidanes, one of the pioneers behind ABS-CBN’s long-running noontime variety show It’s Showtime, still can’t believe that the show he created ten years ago has officially gone global through its international franchise in Indonesia. With It’s Showtime in the Philippines airing hours ahead of its Indonesian counterpart, Jugs Jugueta and Teddy Corpuz kept Pinoy fans posted by providing behind-the-scene snippets of the preparations being made inside its studio which was headquartered in Jakarta, Indonesia. “Naiyak nga ako nung dumating ako dito eh - the very first minute. Nakakatuwa,” Vidanes admitted. “Ako nung nakita ko ‘yung logo parang totoo na ‘yan eh. Showtime Indonesia oh,” Jugueta added. As the Indonesian version went live, It’s Showtime’s local Tawag Ng Tanghalan segment had to be interrupted to welcome the hosts in Indonesia. The two sets of hosts exchanged dance numbers, with It’s Showtime Indonesia having danced to the “bamboo” dance while Ryan Bang, Jhong Hilario, Vhong Navarro, Anne Curtis, Karylle, Amy Perez, and Mariel Padilla having done the “budots” craze. 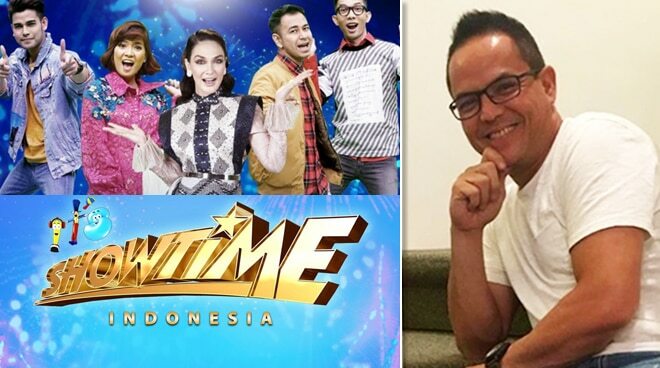 Hosted by Luna Maya, Chika Jessica, Raffi Ahmad, Indra Herlambang, and Pinoy singer-actor Leo Consul, It’s Showtime Indonesia airs on MNCTV. ABS-CBN’s Entertainment Production Division Head Laurenti Dyogi was also present during the big launch of It’s Showtime Indonesia.